The Diving Safety Program provides training and oversight to faculty, staff and students who use self-contained underwater breathing apparatus (scuba) as a tool to conduct underwater research. Scientific diving is regulated at both the state and federal levels. The Diving Safety Program uses training, operational support and oversight to ensure compliance with these regulations. The program also meets the American Academy of Underwater Sciences (AAUS) Standards for Scientific Diving; it is a current AAUS organizational member. The Scientific Diving Safety Program is overseen by both EH&S and the Diving Control Board. The Diving Control Board is an institutional committee assigned to oversee diving safety for the University. Most of its members are active scientific divers. The board has the authority to approve and monitor diving projects, review and revise the diving safety manual, assure compliance with the manual, certify the depths to which a diver has been trained, take disciplinary action for unsafe practices and assure adherence to the buddy system (a diver is accompanied by and is in continuous contact with another diver in the water) for scuba diving. The Diving Control Board's functions are carried out pursuant to the AAUS Scientific Diving Standards. UW Scientific Divers come from various backgrounds and engage in many types of scientific activities underwater. UW divers can be staff, faculty, students or volunteers affiliated with the University. Because they are diving as part of their employment, all divers must meet the requirements of the OSHA Scientific Diving Exemption and follow the UW’s Scientific Diving Safety Manual. See the requirements and steps to become a UW Scientific Diver in the Requirements for Scientific Diver Certification. This document includes links to the diver registration form, medical evaluation form, and other required forms needed for diver certification. As a diver, you are required to record and maintain your dive logs and personal data on the AAUS Dive Log Database. Medical qualification is an essential component of obtaining and maintaining Scientific Diver Certification. Dive physicals must be coordinated through the Employee Health Center. Medical providers will explain the options and requirements for medical exams and qualification. Please contact the Employee Health Center at 206.685.1026 or emphlth@uw.edu. 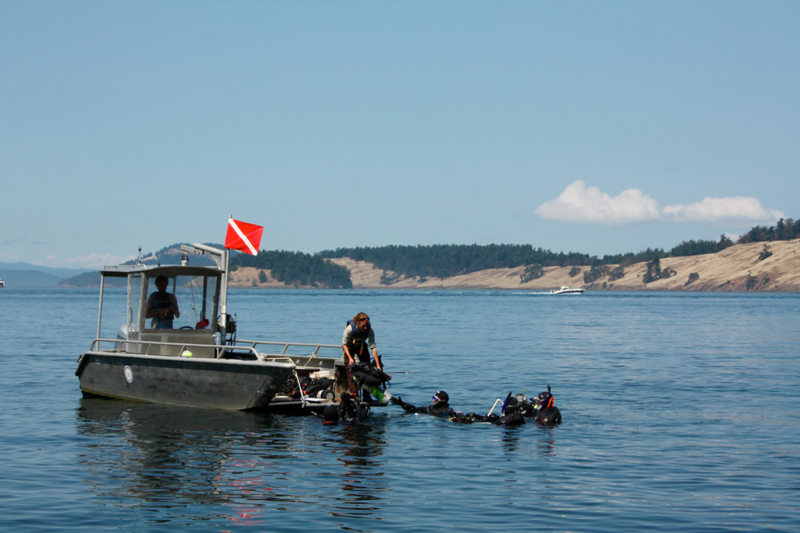 If you are a visiting diver from another AAUS organization, you must provide a Letter of Reciprocity and proof of workers’ compensation coverage before conducting dives under the auspices of the University of Washington, including diving at Friday Harbor Labs. Non-AAUS divers must contact the UW diving safety officer to discuss eligibility. The UW is committed to safe research diving. If you observe potentially unsafe practices, conditions or have questions, please feel free to report confidentially to divesafe@uw.edu. In order to stay safe, do not conduct any diving without the proper training. You must be a certified UW scientific diver in order to conduct scuba diving in affiliation with the UW. Follow the standards in the UW Scientific Diving Safety Manual. Do not dive without an approved dive plan. Never dive alone and always maintain a good buddy distance. Plan your dive and dive your plan. Ensure your gas supply is sufficient and appropriate for the planned dives. Ensure required emergency equipment is on site. I am a UW student, employee or volunteer. Do I need to be a scientific diver in order to dive for a class or research project? Yes. All diving under the auspices of the University of Washington is required to be conducted according to state, federal and UW requirements. I am a UW scientific diver. Am I required to submit a dive plan prior to diving? Yes, all dive plans must be submitted and approved by the diving safety officer prior to conducting the dive. I am a scientific diver from another organization, can I dive at UW? Yes, but only upon receiving approval from the UW diving safety officer. Typically, this process involves submitting a Letter of Reciprocity that you can obtain from your organization’s diving safety officer. Why does UW charge a diver fee and who has to pay it? EH&S has been authorized by the University to recover costs associated with operating the Diving Safety Program. All UW divers must pay an annual fee. Visiting and temporary divers must also pay a fee. Is diving at Friday Harbor Labs different than diving at UW? No. Friday Harbor Labs is a part of the UW College of the Environment, and the UW Diving Safety Program oversees all diving that takes place at Friday Harbor Labs. Divers who plan to conduct scuba diving affiliated with the University of Washington must obtain scientific diver authorization prior to diving. This training is provided on an as-needed basis. Emergency response training (CPR, First Aid, AED and Emergency Oxygen Administration) is offered on a regular basis and is intended specifically for scuba divers. Other trainings for authorized UW scientific divers are offered on an as-needed basis and can include, but are not limited to, scuba rescue, Dry Suit, Nitrox and advanced diving techniques.